Next year is starting to reveal itself and the new Houdini books are lining up! 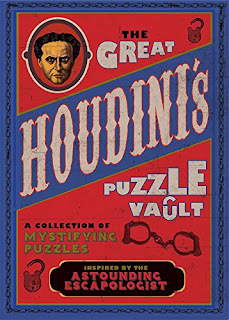 Here's another new title, The Great Houdini's Puzzle Vault. I don't think this has much to do with Houdini apart from the title and cover art. But that's enough for me! At the turn of the twentieth century, Harry Houdini was regularly leaving audiences of thousands amazed at his repertoire of stunts. Escaping locks and chains; digging himself out after being buried alive; freeing himself from a straitjacket while suspended from a crane; each escapade was a little more dangerous than the last and left his growing legion of fans wanting more. 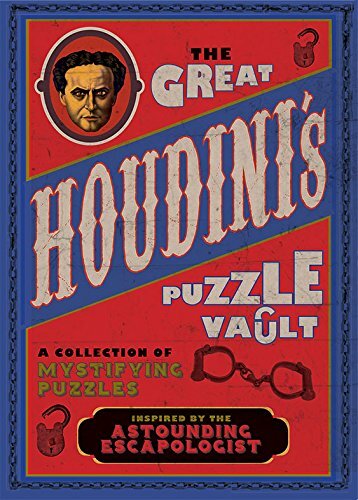 The Great Houdini's Puzzle Vault contains 100 puzzles inspired by the greatest escapologist to have ever lived. With puzzle chains where one wrong answer can leave you locked in a never-ending circle of puzzles, and logic problems designed to confound the minds of the unworthy, this puzzle book is an enjoyable test for all. Unlock your brain and see if you can escape the challenging puzzles inside. The Great Houdini's Puzzle Vault will be releasd on June 1, 2017. So far it is only available for pre-order at Amzon.co.uk (UK). UPDATE: Release date has now changed to October 5, 2017. I looked through this book today...was surprised to see it chock full of Houdini photos, information and drawings - most all pertaining to Houdini and/or Magic. A Must for young (at heart) readers with an interest in Houdini.